Orbanejadel Castillo is a regular town and the administrative rights of the town belong to the municipality. The town was once upon a time independent of the municipality but things changed over time. 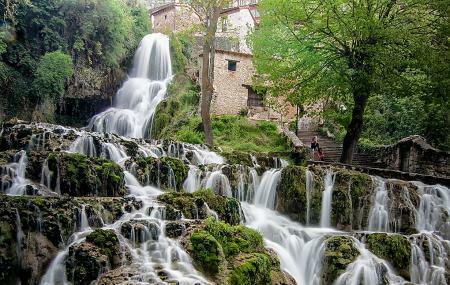 It has been visited by a large number of scholars for geological and scientific interests and the waterfall here attracts a large number of visitors. It’s surrounded on its 4 sides by Báscones of Zamanzas, San FelicesRudrón, Escalada and Villaescusa de Ebro. The Waterfall: The waterfall is why a large number of people visit this place. As the water comes mainly from spring and abundant rain, it is advised to go in October or September to fully appreciate this beauty. Cave Nispero: The cave is located 90 meters above the river and has been an important topographical site. Ensure that you visit the surrounding towns along with this one because each of the towns has a peculiarity of its own. How popular is Orbaneja Del Castillo? People normally club together Cueva De El Castillo and Castillo De Burgos while planning their visit to Orbaneja Del Castillo.